For other people named Willie McGee, see Willie McGee (disambiguation). Willie Dean McGee (born November 2, 1958) is a retired professional baseball player who won two batting titles and was named Major League Baseball's 1985 National League MVP. McGee primarily played center and right field, winning three Gold Glove Awards for defensive excellence. McGee spent the majority of his 18-year career playing for the St. Louis Cardinals, helping the Cardinals win the 1982 World Series with his outstanding performance in Game 3 of that series. A four-time All-Star, McGee accumulated 2,254 hits during his career. He currently serves as a Special Assistant to St. Louis Cardinals General Manager, John Mozeliak. Willie Dean McGee, one of seven children, grew up in a devoutly religious household. His father Hurdice was both a machinist at the Oakland Naval Yards and a deacon in the Pentecostal church. Hurdice did not want his son to play any organized sports on Sundays, so McGee slipped out of the house on Sunday afternoons to pursue his passion for sports. Much later, McGee learned that his father knew that he was sneaking out to play baseball, but decided to let him go on anyway. He also served time as a youth in the Byron's Boys Ranch in Contra Costa County. Upon graduating from Harry Ells High School in Richmond, California in 1976, McGee was selected in the 7th round (152nd overall) of the June amateur entry draft by the Chicago White Sox. McGee declined the White Sox contract offer and opted instead to attend Diablo Valley Community College. A few months later, McGee was selected by the New York Yankees in the 1st round (15th overall) of the 1977 January amateur entry draft. From 1977 through 1981, McGee remained tucked away in the Yankees' minor league farm system, ascending no higher than the AA level during that time. McGee's big break came when he was acquired by the St. Louis Cardinals from the Yankees' farm system on October 21, 1981 in a trade for pitcher Bob Sykes. In 1982, he was briefly assigned to the AAA Louisville Redbirds prior to being called up to St. Louis. In his rookie year, McGee batted .296, with 4 home runs and 56 runs batted in during the regular season. I don't know if anyone has ever played a better World Series game than Willie. If he doesn't make that catch in the ninth, Mr. Sutter's in trouble. In the 1982 postseason, the 23-year-old McGee was quickly thrown into the national spotlight during St. Louis' run to a World Series title. His performance in Game 3 of the 1982 World Series ranks among the best in Series history. Not known for his power, McGee connected for 2 home runs and also delivered a spectacular defensive play in center field, capped by a leaping snare of a would-be 9th-inning Gorman Thomas home run that secured the Cardinals 6-2 victory. McGee became the third rookie to hit two home runs in a World Series game, joining two New York Yankees: Charlie Keller and one of the announcers for the 1982 Series, Tony Kubek (Andruw Jones joined them in Game 1 of the 1996 World Series). McGee was an integral part of the Cardinals' unlikely Series win over the power-hitting Milwaukee Brewers, who were nicknamed "Harvey's Wallbangers" after team manager Harvey Kuenn. During the 1980s, McGee, along with Cardinals teammates Ozzie Smith, Tom Herr and Vince Coleman, would exemplify "Whiteyball", a style of baseball named after Cardinals manager Whitey Herzog. This style of baseball took advantage of St. Louis' spacious Busch Stadium and placed strong emphasis on fundamentals, pitching, defense, speedy baserunning, and smart situational in-game play. McGee hit for the cycle on June 23, 1984 in a classic Cardinals vs. Cubs matchup at Wrigley Field. The game was televised as NBC's Game of the Week. As the Cards led going into the bottom of the 9th, McGee was announced as NBC's "Player of the Game". NBC would later revise that, announcing at the conclusion that McGee and Chicago's Ryne Sandberg would share the honor, after Sandberg hit two home runs (in the 9th and 10th innings) and the Cubs won the game, 12-11. In 1985, McGee ranked first in the National League in batting average (.353, the second highest mark by a switch hitter in NL history), hits (216) and triples (18). He also ranked third in the National League in runs scored (114) and stolen bases (56). Additionally, he earned a Gold Glove Award and a Silver Slugger Award, and was voted to the National League All-Star team. For his superb offensive and defensive performance, McGee was named the 1985 NL Most Valuable Player. His .353 batting average was the highest for a National League player since Bill Madlock hit .354 ten years earlier and was the second-highest National League batting average between 1975 and 1993 only behind the .370 batting average that Tony Gwynn had in 1987. McGee's efforts helped propel the Cardinals into the postseason, where St. Louis defeated the Los Angeles Dodgers in the NL Championship Series. However, St. Louis came up short in the 1985 World Series, as the Kansas City Royals defeated the Cardinals in seven games. The Series was known as the "I-70 Series", named after Interstate Highway 70 which connects St. Louis to Kansas City. In 1987, Cardinals manager Herzog moved McGee to 5th in the batting order. McGee responded well to the move and drove in a career-high 105 RBIs. Again, McGee was a key component to the Cardinals' success as they enjoyed another fine season finishing as Eastern Division champs. After defeating the San Francisco Giants in a heated NL Championship Series, Herzog's Cardinals found themselves in their 3rd World Series contest of the 1980s; the Minnesota Twins defeated the Cardinals in the 1987 World Series in seven games. McGee himself made the last out of the seventh game of the series, grounding out to third base. 1990 would mark the end of the "Whiteyball" era in St. Louis. Amidst poor overall team performance, Herzog surprisingly announced his retirement on July 6. In an effort to begin the team's re-building process, McGee was traded to the American League's Oakland Athletics on August 29 for 25-year-old outfielder Félix José and two minor-league players (third baseman Stan Royer and pitcher Daryl Green). McGee's brief stint with Oakland, managed by Tony La Russa, helped propel the team to the 1990 World Series. This would be McGee's fourth trip to the Fall Classic; the Athletics however were pounded in the Series as the Cincinnati Reds would sweep the defending champions in four games. Despite being traded to the AL, McGee had already accumulated 542 plate appearances in the National League, enough for him to qualify for the NL batting crown. Los Angeles' Eddie Murray (.330 average), the New York Mets' Dave Magadan (.328) and others gave chase, but as none were able to catch McGee's .335 NL batting mark, he won his second batting title. McGee's accomplishment marked an odd first in major league history, in which the batting champion for one league ended the season as a member of the other league. In 1990, George Brett of the Kansas City Royals led the American league with a .329 batting average. Because McGee's batting average over the entire season was only .324, neither league's batting champion led the Major Leagues in batting; that honor fell to Eddie Murray. On December 3, 1990, McGee signed a multi-year contract with the San Francisco Giants. This decision allowed him to continue his professional career in the area where he had been born, raised, and resided with his family. With the Giants, he remained a consistent and productive player, batting near or above .300 each year until an ankle injury befell him in 1994. Attempting to rebound from injury, McGee signed as a free agent with the Boston Red Sox on June 6, 1995 and played in only 67 games that season. McGee had one hit in four at-bats in the Cleveland Indians' Division Series sweep of Boston. He looks like he doesn't have a friend in the world. Meanwhile, all the world is his friend. On December 15, 1995, McGee signed as a free agent and returned to St. Louis for good. Coincidentally, he was reunited with former Oakland manager La Russa, who had just inked a multi-year deal on October 23 to become St. Louis' new skipper. One of the lighter moments of the 1996 season came in the form of a commercial that McGee recorded with Ozzie Smith. As part of the team's "Baseball like it oughta be" ad campaign, Smith and McGee, under the aliases of "Henry Smith" and "Walter McGee" respectively, partially ad-libbed several TV spots dressed as two old men sitting in a bar talking about the Cardinals. Shocked that the shy McGee would do such an outrageous thing, teammates were enthralled by watching outtakes from the TV spots, some of which can be seen on a commemorative video about the Cardinals' 1996 season. An aged veteran at this point in his career, McGee's role as outfielder became limited, averaging about 300 at bats a year. Despite his limited role, he found his stroke again with St. Louis. He batted .307 and .300 in 1996 and 1997 respectively, and provided fans with dramatic offensive sparks that recalled his earlier years. In St. Louis' 1997 home opener at Busch Memorial Stadium, with two outs in the bottom of the ninth inning and the score tied 1-1, McGee hit a pinch-hit home run to win the game, providing a memorable highlight to cap his remarkable career as a St. Louis Cardinal. On August 5, 1999, Willie made a brilliant shoe string catch on a looping fly ball hit by San Diego Padres' outfielder, Tony Gwynn. Had McGee not caught that ball, Gwynn would have recorded his 3000th major league hit. In that same game, St. Louis Cardinals' First baseman, Mark McGwire, hit his 500th major league home run. McGee played his final game on October 3, 1999 when he was the third-oldest player in the majors at age 40. McGee had a .976 career fielding % and from 1983 to 1990 finished in the top 5 among NL outfielders in the category of Range Factor/Game as OF. In 1986, McGee led the NL in Fielding % as OF (.991), Range Factor/Game as OF (2.76), and Putouts as CF (325). McGee's Cardinal Hall of Fame speech. The season after his retirement, McGee was honored with a special ceremony at Busch Memorial Stadium. More recently, there has been some support among fans for a formal retirement of McGee's number 51 uniform number by the Cardinals. On March 6, 2013 the St. Louis Cardinals announced they had hired McGee as Special Assistant to General Manager John Mozeliak. McGee's role as Special Assistant includes working with outfielders in the Cardinals' minor league system as well as monitoring the organization's minor league players, then reporting directly to Mozeliak. On August 16, 2014 McGee was inducted into the St.Louis Cardinals Hall of Fame. 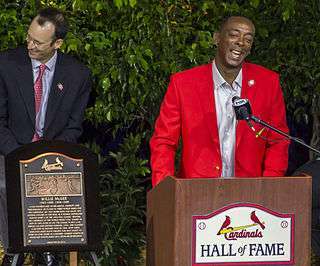 1 2 "Willie McGee is back with the Cardinals". KTVO-TV. Associated Press. 6 March 2013. Retrieved 6 March 2013. 1 2 3 4 Eisenbath, Mike (1999). The Cardinals Encyclopedia. Philadelphia: Temple University Press. p. 239. ISBN 1-56639-703-0. ↑ Eisenbath, Mike (1999). The Cardinals Encyclopedia. Philadelphia: Temple University Press. p. 519. ISBN 1-56639-703-0. ↑ "Year by Year Leaders for Batting average / Batting Champions". Retrieved 2014-05-11. ↑ "Willie McGee". Retrosheet.org. Retrieved 2007-12-16. ↑ Eisenbath, Mike (1999). The Cardinals Encyclopedia. Philadelphia: Temple University Press. p. 240. ISBN 1-56639-703-0. ↑ Baseball Like it Oughta Be – The Story of the 1996 St. Louis Cardinals. Videocassette. Orion, 1996. 1 2 "Willie McGee Statistics" Baseball-Reference.com Retrieved on 2013-02-18. 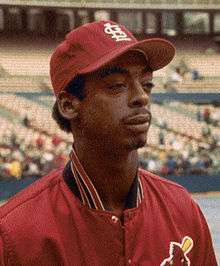 ↑ "Willie McGee Statistics", "1986 National League Fielding Leaders"Baseball-Reference.com Retrieved on 2013-02-18. ↑ [St. Louis Post-Dispatch, Thursday 03.07.2013, Page C3 "McGee Joins Cards, Officially"] St. Louis Post-Dispatch, Thursday 03.07.2013 Retrieved on 2013-03-07.